Will it come to this? Not likely. Still, there is no question that English in America began to change as soon as the Mayflower put down anchor. 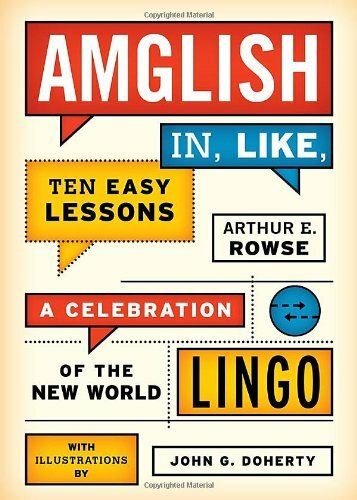 Arthur E. Rowse, a veteran who has spent his entire career in journalism’s trenches, not only recognizes this fact but also celebrates the metamorphosis of American English. It’s true: No language is stagnant. Various factors influence the evolution of usage and vocabulary, but there is no question that this process has accelerated with the advent of the Internet, smart phones, texting, and satellite communication. It’s not just a revolution, according to Mr. Rowse, it’s a tsunami. According to H. L Mencken, early American English reflected a certain rebelliousness as people in the new world reinvented themselves. Spanish, Dutch, German, and other languages provided additional words and phrases. Mr. Rowse adds a more contemporary focus, stating that linguistic boundaries blurred as American military personnel served in foreign countries. He highlights America’s jazz age in the 1930s and 40s, “the cultural Mt. Vesuvius” of the 1960s and 70s, and of course the Valley Girl lingo of the 1980s as playing a part in this process. Yet the tech explosion of the mid-1990s, with much of its impetus coming from the USA, acted like a great wall of water sweeping across global boundaries, creating the basis for an entirely new kind of international communication. Older rules and linguistic standards are quietly fading away. But where does it all end? Mr. Rowse’s answer: it won’t. Acceptable diction has shifted from requiring perfection to simply making yourself understood, regardless of rules. He assures us that there is no reason to panic. Instead, he provides ten lessons for ease of communicating with other people. Just “go with the flow” (Rule #2). The good news is that many people who might otherwise shrink from communicating are freely doing so via texting, Skypeing, etc. It is important for any speaker to realize when a more formal approach (i.e. in the corporate board room or on a college application essay) is necessary. The author refers to this as “code switching” (Rule # 10), meaning the use of appropriate language to fit the setting. He does not dwell on where or how today’s students learn the standards of acceptable professional language. Sue Sommer’s recently published Bugaboo Review—(a manual of correct English usage for high school students), will reassure the reader that English teachers continue to maintain high standards and are finding ways to involve the learner. Students actively contributed examples to this useful reference. Chances are, these same students lose the rules when texting. Amglish is fun to read. Mr. Rowse has a clever way of weaving in his own Amglish, puns, and spoofs to, “you know,” highlight a point. Among these, he comments on Bill Clinton’s deft use of English, which makes him a “cunning linguist.” (Sigh . . . )Congressional Librarian James Billington laments the demise of the sentence—using non-sentences! John Doherty’s illustrations cleverly complement the text. Examples include Rodney Dangerfield’s negative trifecta (“I don’t get no respect no way . . . “), and Sarah Palin’s neologism, refudiate (as in: Do you wish to refudiate that?). Let’s face it. Amglish is here to stay. And just as it has for centuries, American English will continue to change, with some words disappearing and others losing their offensive intensity through excessive use. External forces continually interact, which serve to break down the barriers of distance, language, and culture. In Mr. Rowse’s opinion, what we may be losing in terms of linguistic perfection is actually leading us to communicate more and thus to greater understanding between people. Don’t fight it, Dude. Like, join it. Diane Brandley is a newspaper columnist, magazine contributor, and book reviewer who also worked for 40 years in non-traditional roles in education and program administration.